Jay: You are always awesome. You are always awesome. I want to see you all bummed out and sad sometime because no one has ever seen it. It’d be like seeing a narwhal or a unicorn or something like that. Mari: Occasionally. I have my moments. Jay: So, you’ve got a new book coming out in mid-October. Tell us all about it. I’m really, really excited because it’s the fusion of what we all know is the technical aspects of social media, what buttons you press, what tools, what stats to measure, all the kind of left brain hard skills as well as something that I’ve really honed a lot over the years, which is the soft skills, the people skills, which is crucialfor real success, in my opinion, in social media online and offline. It’s having skills like empathy and really being able to listen and read between the lines and expressing genuine care and compassion for people, regardless of where they come from. It’s really interesting. It’s like the whole essence is about leveling out the playing field, if you will, so that brands, businesses of all sizes literally can friend their customers and prospects. I like to think of the acronym B2C and B2B as really being more like P2P now, people to people. Jay: Do you find that as more and more people gravitate towards social media and start to use the tools and the shortcuts that we lose some of those soft skills, that we misplace those? Look, I can set it on HootSuite or Buffer and forget it, and it’ll fire out automatically, and then we start to lose some of that human touch. I feel like, in some ways, it’s becoming more about the media and less about the social. this once at an event: It’s a baby with a mustache. Jay: It’s true. I started online in 1994, which is really early in this game, and that’s a long time, kind of, but it’s fewer than 20 years. Mari: Right. Well, but the social aspect of it actually was the paradigm shift because businesses are missing out if they think they can just use these tools. There are some terrific tools, HootSuite for example, but if you think that you can just automate, set and forget, you’ll get some results. But it really will not be the same kinds of results if there can be some genuine interaction and someone in charge of that in the company, that could be outsourced, who’s listening and paying attention because you know why, the consumer has come to expect it. They will take their dollars to the company that engages with them and treats them like a real human being, not just a number on a list. Jay: Yeah. What’s really interesting though is my book, in part, is about speed and having to do things faster as a company. I find that those two things tend to sometimes work at cross purposes. So, customers expect us to be faster as a company, but yet they also expect us to engage with authenticity and with empathy and with caring. It’s hard to do both of those things at the same time, isn’t it? Mari: It is. It actually is, and there are some tips that I talk about in my book that would be rapport building skills, like using people’s first names. Believe it or not, a person’s first name is the sweetest sounding word in their entire vocabulary. For example, if somebody’s Twitter handle includes their name, you can still say, “Hi, Jay @JayBaer. It was great chatting with you today, Jay. I really, really appreciate you.” Using people’s first names in any correspondence where it feels natural. If you do it every time and always at the beginning or whatever, it’s going to look forced and contrived. But, naturally, you’re doing your best to communicate online, the same way that you would in person chitchatting with a friend. And even, it’s not necessarily as you scale and get larger as a company or a brand or a person, not having to think that you have to respond to everybody because it’s not humanly possible. It’s not really scalable, but if you respond to enough people in a day in a warm, friendly, sincere way and with the rapport building tips, people can really feel when you’re genuinely giving and helping them versus like, oh yeah, by the way P.S. we can help you and buy our product, and here’s a link, always turning into a sale. To me, you can accomplish a lot in a short period of time when you are consistently showing up as that genuine and caring person. There are many, many people and brands that do a great job of this. Jay: I’m glad you mentioned consistency, because a lot of people spend a bunch of time in a row on social media, and they lock it down for two hours or three hours. Then, they go away for the rest of the day or for a week, and it becomes this very staccato participation wave where they’re overwhelmed by it and then they’re not involved at all. I suspect that you recommend the opposite, more of a sustained level of involvement. Is that true? Mari: A hundred percent. It’s funny. I was just doing a session earlier, and one of the questions I got asked was about how much time a day should you spend. I always find that an awkward question. Jay: That’s a hard one, yeah. Mari: Well, it just depends on how much time you have available, what your goals are. What resources do you have available? But, I’ll guarantee you this. If you focus more on consistency versus the amount of time where it is a certain amount, literally you are showing up, it’s more of a consistent presence. Jay: One of the things that I do to sort of take advantage of how people do dive in and dive out of Twitter, in particular, is a lot of times when I’m tweeting posts of my own, my own blog posts and things like that, I typically tweet those within three minutes of the top or the bottom of the hour, because I figure more people are checking Twitter right before their next appointment or right after their appointment ended. So, I’ve actually tested it, and I’ve seen a lot better results in that six or seven minute window right before and right after the top of the hour than at 4:22 or 4:44, things like that, when people are probably involved in some sort of a meeting. Mari: That’s a great tip. That’s an awesome tip. I love HootSuite for Twitter. I use it every single day because you don’t necessarily get penalized or anything for using a third party on Twitter. You do a little bit on Facebook, but it’s great for that scheduling. Another tip right on the back of what you just shared is one time recently, and I think it’s maybe KISSmetrics that had done this infographic. I’ve lived in the States for eleven and a half years now, and I never knew this. It said 80% of the American population lives in the Central and Eastern time zones, and I’m in Pacific so I maybe start tweeting around 8:00 a.m. Well, it’s already 11:00 a.m. on the East Coast. So, I started to back it up a little bit and program some tweets to go out at 5:00 and 6:00 a.m. my time, and noticed like you better traction for that, too. Jay: One of the questions that I think is on a lot of people’s minds right now, especially with the release of Google+, is more more? Is doing more in social media, or participating more with relationship marketing, is it a linear relationship? The more time I spend, the better off I’ll be. If I’m in Twitter and Facebook and LinkedIn and Google+, is that inherently better than just being in a couple? I get that kind of question from thought leaders and business owners all the time, and it’s a hard one to answer. What do you think? great, my hat’s off to you. I have great admiration to mention Chris Brogan’s name again. I was a little shocked at first, but I did have some admiration that he just put a sign up on Facebook when Google+ came along. He’s like, “I’ll move. If you want to interact with me, I’m over here.” He’s the first to admit, he never really fully embraced Facebook. For myself, it’s totally different. Jay: Yeah, almost the opposite, right? That’s always been your place. Mari: Exactly. I’ve always just been madly in love with them. They are my first love. It was challenging for me in the last – what’s it been now – about six to eight weeks since Google+ really first launched because I was excited. I was saying to people, my God, I’ve never been this excited since May of ’07 when I first got on Facebook. The cool thing I found, even though there are many, many thought leaders, many experts are on Google+ and they’re sharing voraciously, I found to get some tremendous mileage at one post a day. One post a day, that’s it. That’s the thing we were just saying. The consistency is there. So, right now I am managing my own presence on Google+ and Twitter. I do all my own tweets. But Facebook is where I implemented a whole new campaign recently, thanks to something I learned from Jeremiah Owyang about scalability. He talked about how it’s really challenging for brands and businesses to use social media as a customer service mechanism because it’s a bottomless pit. You keep throwing money at more community managers, and it just keeps scaling and scaling. His recommendation was to create a customer advocacy program. I’ve actually recently implemented what I call my MVPs or Mari’s Valuable Peeps. I have about a half dozen members of my community, who totally for free, out of the goodness of their heart, are answering questions for me on my fan page. I give them exposure in exchange. I drive people to their sites and their pages. They get business because they’re in a slightly different business, doing fan page design. You’ve got to find what works for you. Jay: The thing is those people will rise to the challenge. They’re hungry for an assignment, and that is very much what AOL did back in the day when AOL found themselves with tens of thousands of chat rooms, back when that was the thing, pre-Facebook, pre-Twitter, pre-MySpace. So, you can’t, as a company, have 10,000 paid moderators, right? It just doesn’t pencil out. So, they said, “Okay which of you people who are totally into goldfish or Harley-Davidsons, or whatever this is about, wants to be the king of the geeks? Raise your hand. Congratulations, you’re the moderator.” It makes a lot of sense. It’s a smart strategy. Mari: You can do that. You do that on a fan page on Facebook because people can post as their own fan page. Jay: One of the things I like a lot about the book, and I’ve had a chance to read most of it, is you talk a lot about having a brand positioning for yourself, right? So, knowing what role you play, not in an artificial way, but what role do you play in these communities? In your case, you are the relationship marketing expert. You are the Facebook marketing expert. Everybody who knows you knows that, and you are extraordinarily good at staying consistent about what it is that you do and the value that you offer. However, I see a lot of people doing that poorly, as I’m sure you do as well. So my question is: What do you think is the bigger mistake, inconsistency of effort or unfocused branding? Jay: To be a true relationship marketing expert, can you do that as a content curator, or do you have to be a content creator? Curation is all the rage now. Everybody wants to go out there and show people what are good resources versus what are not good resources. It’s valuable, and I do a lot of it, as you do as well. But can you really get to where people want to get by just doing curation, do you think? Mari: Well, it’s a brilliant start. Somebody who may be making a career transition or they really want to establish themselves as a thought leader and become an authority. I love how the root word of authority is author. If you want to be an authority in a niche, author more, write more. It doesn’t mean you have to have a published book. Eventually, you might, but write more content for blogs, for your social profiles, for commenting, etc., but in addition you want to be a great curator. The key distinction from the relationship marketing standpoint is you want to put yourself into the curation. Don’t just hit retweet, retweet, retweet, and forward, forward, share. Actually make a little comment. 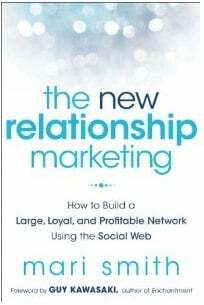 (in mid October) it’s The New Relationship Marketing from Mari Smith. The root of authority is author, everybody remember that. And follow one course until successful. Everybody remember that. Thank you very much for the time, and I really appreciate it. Mari: And you, likewise. Thank you.